An American favorite: the jelly doughnut. Photo by Thomas Marek | Dreamstime. A doughnut is a pastry, a small, fried ring of sweet, leavened dough. Doughnuts leavened with baking powder are more dense than the fluffier, yeast-leavened doughnuts. There are many types of doughnuts. Just a few examples include bismarks or jelly doughnuts, raised doughnuts leavened with yeast, squares and twists, crullers made from twisted cake-doughnut dough and French doughnuts made with cream-puff pastry dough. Doughnuts can be filled or unfilled, plain, glazed or iced. Originally a Dutch recipe without a hole, the dough is dropped into hot oil, and was originally called an olykoek, or oily cake. The first written reference to “doughnut” is in Washington Irving’s 1809 in History of New York, where he writes of “balls of sweetened dough, fried in hog’s fat, and called doughnuts, or olykoeks.” The first known printed record of the shortened “donut” appears in “Peck’s Bad Boy And His Pa,” a story by George W. Peck published in 1900. As the story goes, in 1847, 16-year-old American Hanson Gregory created the hole in the center of the doughnut. He used the top of a round tin pepper container to punch the holes, so the dough would cook evenly. And the rest is history! See our Pastry Glossary for the different types of pastry. What could be better than a warm, homemade jelly doughnut? While this is not the simplest recipe, if you are comfortable with deep fat frying, it’s not difficult. Use a favorite jelly, jam or preserve (see the difference) in your recipe. 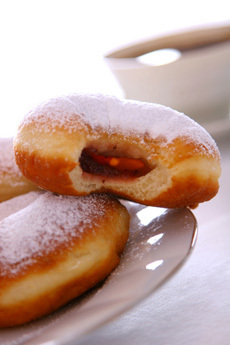 In this recipe, the jelly is not injected into the doughnuts, but is placed on the bottom half of the doughnut round before it is fried. For variety, you can divide the batch and use two different flavors of jelly/jam/preserves. Don’t be afraid to “bake outside the box”: While raspberry jam is a classic, guava jelly, grapefruit marmalade or rhubarb preserves, for example, are a delicious change of pace. We enjoy using currant jelly instead of grape jelly. Fruit curd is also a delicious filling. If you like it hot, try a pepper jelly such as Aloha From Oregon or Diane’s Sweet Heat. In a mixing bowl, combine yeast, salt and flour; stir in milk and beat thoroughly. Cover and let rise for 30 minutes. Add the sugar, eggs, nutmeg and remaining flour. Let the dough rise again until it is light. Punch the dough down with your fist. Fold the edges of the dough toward the center and put it on a floured mixing board. Then slap it hard to force out all of the gas and let fresh oxygen reach the yeast. (Like hitting a golf ball, punching dough helps get rid of one’s aggressions, as well. If you enjoy it, start to bake bread). If the dough is too soft to handle, add more flour. Re-flour the board generously. Divide the dough into two parts, covering each with a bowl. Let rest for 10 minutes. This makes the dough easier to handle. Roll dough about 1/2-inch thick. Cut into rounds with a floured 2-1/2-inch biscuit cutter. On half of the rounds, place a heaping teaspoon of jelly or jam. Brush the edges with beaten egg white and place the remaining rounds on top. Press the edges together. Let rise about 1 hour. TO FRY: Put enough oil in the fryer so that it will cover the doughnuts, but is at least 3 inches from the top of the pot. Heat the fat to 360°F. It’s important o keep the heat constant: If it’s too cool the doughnuts will absorb the fat; if too hot, they brown on the outside before the centers are cooked. Gently lower doughnuts with a slotted spoon, three or four at a time or however many your fryer can hold without crowding. When the first side is brown, turn over. When done, lift with a slotted spoon and drain on paper towels. To sugar, lightly press the top of the doughnut onto a sugar-filled plate. You’ve worked hard, so enjoy a doughnut!